VA Form 21-0512v-1 or the "Old Law And Section 306 Eligibility Verification Report (veteran)" is a form issued by the United States Department of Veterans Affairs. 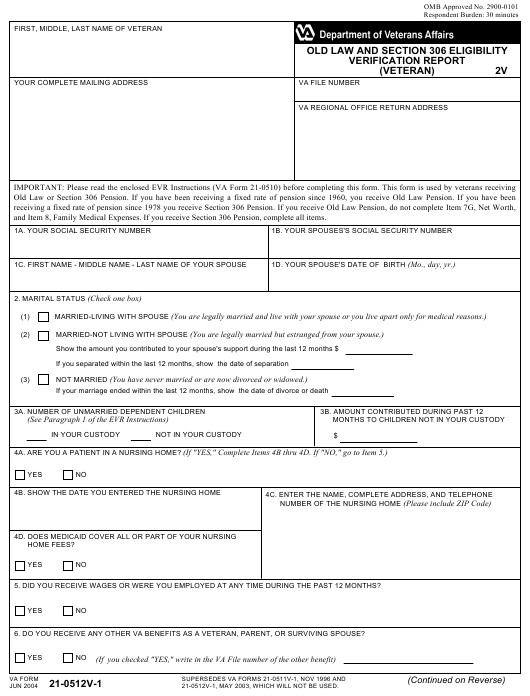 The form was last revised on June 1, 2004 - an up-to-date fillable PDF VA Form 21-0512v-1 down below or find it on the Veterans Affairs Forms website. and Item 8, Family Medical Expenses. If you receive Section 306 Pension, complete all items. 4A. ARE YOU A PATIENT IN A NURSING HOME? 5. DID YOU RECEIVE WAGES OR WERE YOU EMPLOYED AT ANY TIME DURING THE PAST 12 MONTHS? 6. DO YOU RECEIVE ANY OTHER VA BENEFITS AS A VETERAN, PARENT, OR SURVIVING SPOUSE? 21-0512V-1, MAY 2003, WHICH WILL NOT BE USED. NOTE - If no income or net worth was received from a particular source, write "0"or "none." DO NOT LEAVE ANY ITEMS BLANK. Exception: Report your spouse's income only if you receive Section 306 Pension. NOTE - If no income was received from a particular source, write "0" or "none." DO NOT LEAVE ANY ITEMS BLANK. 7C. DID ANY INCOME CHANGE (Increase/Decrease) DURING THE LAST 12 MONTHS? 7E. WHEN DID THE INCOME CHANGE? 7F. HOW DID INCOME CHANGE? NOTE: Complete only if you receive Section 306 Pension. Skip to Item 9A if you receive Old Law Pension. NOTE: Skip to Item 9A if you receive Old Law Pension. Report, to report your medical expenses. material fact, knowing it is false, or fraudulent acceptance of any payment to which you are not entitled.